Although rising interest rates will likely taper demand for dividend-paying stocks, we have seen a significant expansion in the universe of companies with the ability and willingness to pay a dividend. The high-yielding sectors — the so-called “bond proxies” — particularly REITs and utilities stocks, will be most affected by initial interest-rate moves. Looking ahead, however, it is important to consider the reason for rising rates: broadening improvement in the economy, which is good for equities. Historically, dividend-paying stocks were almost exclusively those in defensive and “bond-like” sectors such as telecom and utilities. Over the past few years, however, we have seen a significant expansion in the universe of companies with dividend-paying proclivity — the ability and the willingness to return cash to shareholders. 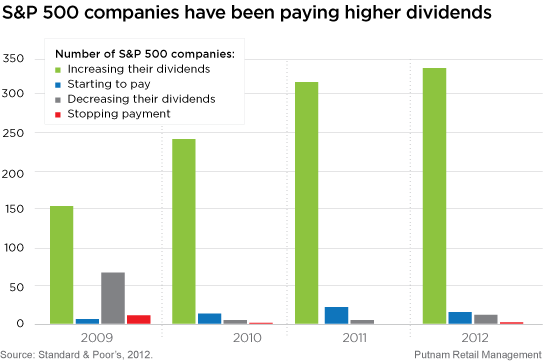 Currently, approximately 80% of S&P 500 companies are paying dividends. And, even more important, the practice has extended well beyond the defensive sectors. For example, over the past few quarters, many information technology companies, a group that traditionally withheld cash for reinvestment or other purposes, have initiated or increased dividends. In fact, I would estimate this trend is occurring in a majority of the S&P 500 sectors — even in this rising-rate environment.